First article for The Naked Scientists! …. AND I’ll be on their show on Sunday (12th Feb) from 6 – 7pm talking thermoelectrics! It’s a fact that almost 70% of the energy released from the fuel by a car engine is lost, mostly in the form of heat. And the turbines that generate most of the world’s electrical power manage to convert only about one-third of their energy into electricity. Sadly, energy is “wasted” like this everywhere. Or, more accurately, ends up in a form that is not useful to us. All mechanical systems produce heat as a by-product but most of the time this valuable energy is just thrown away, or written off as a loss. Butthermoelectric materials have been hailed as one solution to this energy problem – they can take heat and convert it into useable electricity. Assembled into so-called thermoelectric generators, or TEGs, they can soak up heat that would otherwise be wasted and produce an electrical current. Critically, they can do it without the requirement for any moving parts. So how do they actually work? TEGs depend upon a temperature difference to “drive” the device – so one side needs to be hot and the other side cold. This temperature difference makes the electrons one the “hot” side vibrate more vigorously so they tend to move towards the colder side where the electrons are moving more slowly. This movement gives rise to a current that can be tapped off as electricity. This phenomenon is known as the Peltier–Seebeck effect after its nineteenth Century discoverers, Jean Charles Athanase Peltier and Thomas Johann Seebeck. Seekbeck showed that linking up two different conductors that are at different temperatures results in a voltage being produced between them. 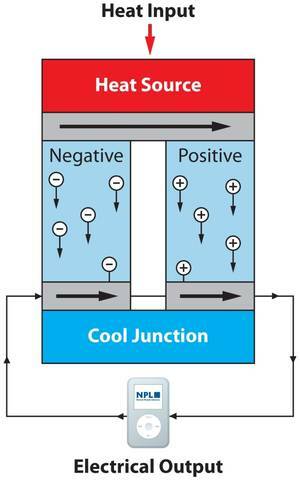 Peltier’s contribution was the discovery that the junction between two conductors develops a temperature difference when a current is applied. And in a further “effect”, Lord Kelvin (also known as William Thomson) demonstrated that the size of this voltage is related to the difference between the two temperatures. So, taken together these effects mean that connecting the right materials together in the presence of a temperature difference converts heat energy into electrical energy, and the bigger the temperature difference, the more electrical power you produce. But there are complications. The trick with thermoelectrics is that you want the heat to stay at the hot end for as long as possible, keeping the temperature gradient in place, yet still allowing the electrons to flow freely. But this flies in the face of what we understand about thermodynamics, because materials that allow electricity to flow also generally allow heat to flow. So finding a material that does one but not the other is a huge challenge. That said, materials with high electrical conductivity but low thermal conductivity do exist. In fact, most commercial TEGs contain the rather exotic-sounding bismuth telluride (Bi2Te3), which is about 4% efficient at 250°C. For higher temperatures we need to use silicon and germanium.These are more common materials but are much less efficient at turning heat into electricity. Thankfully, scientists are confident that, by resorting to “nanosculpture” to craft the structures of the materials in just the right way, it is possible to create substances that simultaneously impede the flow of heat but are very permissive for the flow of electrons, and this will dramatically improve the efficiency. But a problem that needs to be solved first is how we actually define the efficiency of thermoelectric generation. This is challenging owing to the complex nature of the materials. For instance, you wouldn’t try to weigh something unless you had a prior concept of mass and some sort of unit or scale, like the kilogram. So one area in which UK scientists at the National Physical Laboratory at Teddington, London, are taking a leading role is in the development of measurement standards against which TEG performance can be rated and compared. Despite the present stumbling blocks, TEGs are nonetheless playing an active role in assisting researchers in pushing the boundaries of scientific discovery out in space where this technology has successfully powered space probes and missions for the last 50 years. Admittedly, most “local” missions use a combination of solar panels and on-board batteries, but as you move farther from the Sun to explore more distant planets and the outer reaches of our system where the light intensity is much lower, solar panels become impractical. Consequently, space scientists instead resort to radioisotope thermoelectric generators (RTGs) to produce power. The Apollo astronauts relied on these devices during their Moon missions, and the Cassini and Voyager spacecrafts are also powered by on-board RTGs, which work by converting the heat released by the decay of a radioactive source, such as strontium-90 or plutonium-238, into an electric current. In space, the required “cold side” for the device is also easy to supply given that the average temperature is just three degrees above absolute zero (-273.15°C), the temperature at which atoms completely cease all motion. There are also a number of significant advantages to RTG technology. They can produce power for a very long time, they do not contain any corrosive fluids and they have no moving parts, although critics have expressed concern about the safety of launching radioisotope sources from Earth, so there are tight regulations in place to ensure their safe use. But what about back down on Earth? Thermoelectrics can help here too. 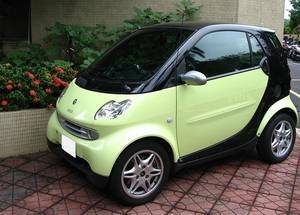 There is a lot of interest in reducing the carbon footprint of your average family car and one way to do this is to improve the overall efficiency. All cars produce a lot of heat, most of lost along the exhaust pipe, but over the last ten years huge leaps have been made in the development of thermoelectric assemblies to “recycle” some of this wasted energy. Specifically, TEGs can be attached to the outside surfaces of the exhaust pipe. The high-temperature gases passing along inside can be used to heat the “hot side” of the TEGs while the “cold side” is created by using water-filled pipes, or even the air movements created by the motion of the car, to remove heat. Early prototypes of these systems have produced about 600W and reduced fuel consumption by 5%, so they have a lot of potential. BMW, Chevrolet and Volkswagen are all developing TEG systems, so we may see them on cars very soon.